“Look around! Can you see all the ribbons on the trees and houses?” said Pele, a resident of Bukit Duri; a slum located along the Ciliwung River in a strategic area of Jakarta. I couldn’t help but notice that they were really high, probably four to five meters above the ground. “That’s how high flood water gets during rainy season!” were Pele’s words. Climate change is a global phenomenon that is proving costly for cities around the world. Its effects on livelihoods, basic services, housing, health and infrastructure are increasingly palpable. However, cities suffering from climate change are also major contributors to the phenomenon. In light of the unprecedented demographic shift to cities, it has become urgent to build sustainable and resilient infrastructure. Furthermore, cities need to take a completely different approach. Instead of combatting the effects of climate change, cities should design decisive solutions to combat its causes. Like other megacities, Jakarta – the densest urban area in Indonesia and host to this year’s New Cities Summit – faces a series of challenges associated with climate change, including flooding – and floods should not to be taken lightly! Flood damage triggers significant economic and social losses; businesses get severely hurt and many are forced to close. Production temporarily stops. Public transit comes to a standstill with cars abandoned in inundated roads and flights delayed or cancelled. Inflation rates increase, houses are destroyed and the city’s infrastructure deteriorates. Last but not least, life quality decreases as sanitary conditions worsen and diseases spread, affecting riverbank residents the most. As a consequence, some get killed, and, at times of severe flooding like in 2007, hundreds of thousands are forced to flee their homes. We can identify three major factors that contribute to the increase of floods: land use changes, waste discharge and climate change. The first two factors are closely related to the establishment of settlements on the riverbanks. Where residential and business developments have become part of the landscape, entire forest areas and farming plots have been turned into paved areas and concrete buildings. Many of these buildings have been built on land specifically designated as water catchment areas, prohibited for development according to spatial planning laws. Consequently, they have become ‘waterproof’ and the river section has become narrower, enhancing surface run-off. 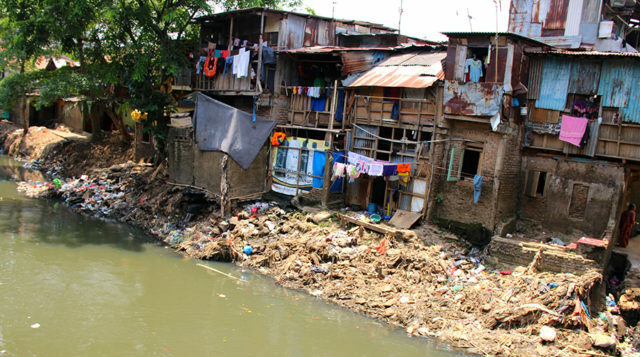 Moreover, the river has become a dumping site for agricultural, industrial and domestic waste. Measures of pollutant concentration have shown an annual increase of pollutant parameters such as ammonia, detergent, phosphates, and E. coli bacteria. Inadequate waste collection facilities on site have also exacerbated the pollution load, leading to higher levels of river sedimentation, and thus reducing drainage capacity. Lastly, the intensity of rainfall events – including average and maximum daily rainfall as well as total rainfall – has been increasing continuously in the capital. With 40% of its total area lying below sea level, Jakarta is naturally vulnerable to climate change, and weather-related disasters. Climate change contributes to the exacerbation of the drainage problem as heavy rainfall on ‘waterproof’ areas causes an increased run-off into the Ciliwung river. Government agencies become increasingly aware of the necessity to put flood prevention at the top of the political agenda. In 2013 they designed the Ciliwung River Normalisation Programme. This program aims to help reduce run-off and waste contamination as a measure for flood prevention. It includes the widening of the river from around 20 to 50 meters, a 7.5 meter inspection road on each side of the river with green areas in-between, and the relocation of the riverbank communities following the Resettlement Policy Framework. Through this program, the government also aims to improve well-being by creating healthy living environments, and utilizing the river for low-cost public transportation. However, relocation plans have sparked uproar among local communities, who feel that their socio-economic needs are not taken into account in civic design. Bukit Duri’s residents work in the informal sector, excelling in 33 different activities including; running a chicken slaughterhouse, a factory for “bakpao” [an Indonesian steamed bread filled with meat], food stalls and much more. Most often, residents’ living and working places are one and the same. They have succeeded in building a strong communal identity in a setting where the distinction between public and private space is blurred. “We’re all part of one big family,” is a sentence I often heard while walking around the village, doing my field research on urban planning and relocation issues for the local think tank, Transformasi. As a result, Bukit Duri’s residents have actively engaged in the design of more humane and sensitive housing, with the support of Ciliwung Merdeka, an NGO run by father Sandyawan Sumardi. This alternative architectural style focuses on the needs of the communities and the environment. It consolidates land to prevent flooding using environmental-friendly materials and makes room for the informal sector to keep running. Finally, it respects the highly valued social space found in villages, which has enabled the urban poor to develop their own survival tactics. At Transformasi, we strongly believe in sustainable urban development, and the need to improve urban living standards by implementing comprehensive urban and spatial planning policies. We actively engage in activities that bridge the gap between the research and policy worlds. The upcoming New Cities Summit in Jakarta is such an activity, bringing together a spectrum of leaders, thinkers and doers from different disciplines and global regions to discuss the future of cities. By collaborating with the Summit, Transformasi will bring local knowledge based on systematic evidence, as well as objective analysis to support conversations on urban resilience. As the correlation between the increase of settlements and the increase of floods is not negligible, it has become essential to understand the quantitative and qualitative effects of establishing settlements on the riverbanks to be able to move forward. Solutions will have to include a technical dimension, whilst also taking into account socio-economic concerns. However, is Indonesia ready to accept community participation in urban and spatial planning? Transformasi has just joined us as a Partner for our New Cities Summit in Jakarta. 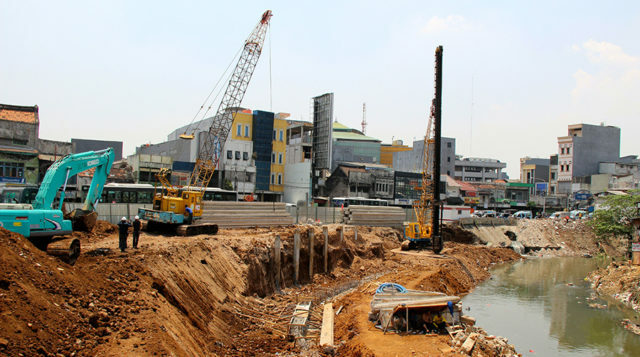 Find out more about the development of the Ciliwung region of Jakarta in this video. Discover the work of Transformasi at www.transformasi.org. Sarine Arslanian is an Intern at Center for Public Policy Transformation (Transformasi), an Indonesia-based think tank that engages policy makers, scholars and the public in the investigation of public problems, the design and development of solutions and monitoring and evaluation of results. Sarine recently graduated from the University of Cambridge with an MPhil in Development Studies.